When it comes to zombies, I am strictly Old School, and believe that everyone else should be, too. Give me the Haitian zombie any day, the zombie of voodoo legend and nightmare, the zombie of the pulp novel and old N’Orleans and Val Lewton. The modern flesh-eating variety is strictly a creation of George Romero, and for that Romero and his horde of even less talented imitators have a lot to answer for. How many times can Night of the Living Dead be remade and ripped off? Is this the single most mindlessly aped movie in history? I think it must be. Some critics exalt Romero’s work as being laced with Deep Social Commentary. I don’t see it. Sometimes a train is just a train, and for me, Romero's movies have no redeeming social context at all, but simply are what they are: revolting exercises in pushing the envelope as to how far he could get away with shocking the sensibilities. To the people who find “entertainment” in graphic images of animated corpses ripping out people’s internal organs and feasting on them... well, you go ahead and enjoy yourself. After all, we live in a diseased culture that’s providing you with plenty of material for your perverted wet dreams. Go to town. Now. All that said, I have a confession to make. And I’ve been hating on the modern zombie for so long that it’s not an easy one. I don’t read Robert Kirkman’s Walking Dead graphic novels for the same reason that I don’t watch the A&E TV adaptation of them: it’s just more repetition from the same Trough of Ugliness, and I hated it all in the first place. 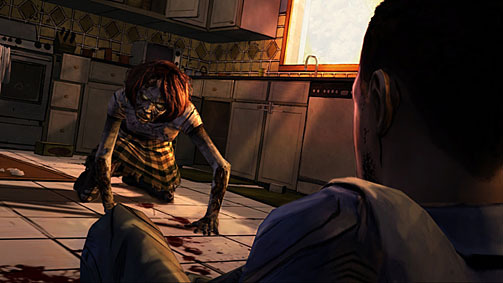 But when Telltale Games brought out its five-part episodic game based on The Walking Dead earlier this year, I was curious enough to look into the project. First, the creative forces behind Telltale are nearly all former LucasArts employees, largely the same team that gave us adventure game titles like Sam and Max Hit the Road, The Day of the Tentacle, Monkey Island and Full Throttle ‘way back in the ‘90s. If computer games can be said to have had “classics,” those titles all need to be among them. Since forming their own company, Telltale have released an impressive array of titles, including sequels to both Monkey Island and Sam and Max featuring the original voice casts, as well as ambitious add-ons to Aardman Studios’ beloved Wallace & Gromit. But the new games, although accomplished and enjoyable, just didn’t have the magic, the golden touch, so to speak. Telltale was poised (and they needed) to knock something out of the park. Enter The Walking Dead. Although I didn’t care for the subject matter, I was impressed by the visual style of the thing, its somber color palette and hand-painted, graphic-novel look. The designers were clearly not going for a digitalized or conventional computer-game appearance. I thought, if they can animate that look effectively, they could have a pretty powerful visual presentation on their hands. Well, I’m a writer and cartoonist. This is like dangling peanut-butter Oreos in front of me. I decided to try the first episode. And once I’d done that, I was All In. Because Telltale’s The Walking Dead isn’t really a game at all, but a kind of wickedly clever Social Experiment. It puts you in one Terrible Situation after another and then asks you: What would you do? What would you do if you were stuck between a rock and a hard place and you had two, maybe three choices, and all were horrible, horrible choices -- and oh, by the way, Time Is Running Out, you can’t stop to think, because in some situations not making a choice is the same thing as making one and you’ll still have to live with the consequences. Or die with them. Not only that, but it isn’t just you that you have to worry about. There’s a little girl involved, and you’re responsible for her. Never mind the zombies. Well, OK, you can’t ignore them. But they’re not what this game is really about. It’s about YOU. It’s about what kind of a person you really are in a pinch, not the kind of person that you say you are. Would you tell the truth about your past, or lie about it? Would you steal the food? Would you give a suicidal person a gun? What if the circumstances were... different? Who do you save when the chips are down? Although Telltale has had to supply all of the blood and gore that fans of this genre have come to expect, I’ve found that I’m able to get through the worst bits, in part because of the shadows and the muted color scheme that Telltale has built into the design, but also because I’m not a spectator, not just idly sitting back and watching these things happen. In episode one, for example, when a zombified babysitter attacks unexpectedly and the only defensive weapon at hand is a hammer, I know what I’ve got to do. The situation is dramatic enough and visceral enough that my will to survive outweighs my essential squeamishness. On the other hand, I do sometimes find myself squinting, closing my eyes and looking away when I can afford to, just as I would in real life. As advertised, this is not a shooter. There’s a plot and there are characters and you have choices to make just like real life, and it absolutely matters who you align yourself with. There’s even one decision in the first episode that decides which of the other characters survives to travel with you into future chapters. The game asks if you have the strength to do some terrible things, and puts them in a context that makes it meaningful. Words don’t do justice to how addictive all this is. The evidence can be found on Telltale’s fan forum, where customers frequently wail (not too strong a word) about the plodding, not to say erratic, not to say sadistic release schedule that Telltale has adopted for each new “episode” of the five-part game. Part four recently came out for most platforms; iOS users only just got episode three. The wait between episodes can indeed be excruciating. Why? Because we’re so emotionally invested in this thing. It’s not about bashing zombies, not at all. Even in the context of an artificial gaming experience, when people are put in a hypothetical situation with realistic characters that play on their emotions, and then are forced to make awful decisions under extremely stressful conditions... there’s no two ways about it, it’s hard not to become involved. Telltale have made monsters of us all. Episode three contains some of the worst choices yet; during my playthrough, there were times when I was caught off guard and simply dropped the ball, made mistakes, and Bad Things Happened as a result. Now, if I wished, I could go back and re-play those scenes until I got it right, until I achieved the result that I really intended: but in real life you don’t get replays, and I’m playing this very lifelike game as if there was no going back. Oh, Poe -- No Go.